Zojirushi NS-ZCC10 Rice Cooker Review - Is It Worth The Price? The Zojirushi NS-ZCC10 or NS-ZCC18 is very popular among consumers. It looks really nice in premium white. The shape sort of looks like an egg with its white color. LOL…… The image on the left is the NS-ZCC18 which you can use to cook up to 10 cups of uncooked rice, and it will yield you about 20 cups of cooked rice. The NS-ZCC10 can cook up to 10 cups of cooked rice. So you might have to decide which one is a better option for you and your family. If you have more members in your house then I suggest to go with the bigger one and if less family members like two to three go with the smaller one. What Is So Great About This Rice Cooker? How Long Does It Take To Cook Rice? Can This Be Used For Steaming? Does It have a Keep Warm Function? Can You Use The Inner Pot To Wash Rice? NS ZCC10 Replacement Pan Or Bowl? Do I Have To Change The Lithium Battery? How Many Watts or Volts Does It Use? How To Extend And Retract The Power Cord? How Many Years Warranty Does It Cover? Where Can I Find The User’s Manual? You might be asking what is so great about this model of rice maker? Well, here are the following things I found out that you can do with this cool gadget. This cooker has a built in MICOM (microcomputer) technology to make all kinds of rice listed on the menu setting, and it tastes so much better. In other words, it has a microchip installed in the rice cooker to be able to think for itself to make adjustments on the temperature and heating time according to the different kinds of rice whenever you use it. It is pretty nifty. A basic rice maker isn’t able to do that. It can only react to the temperature of on and off. 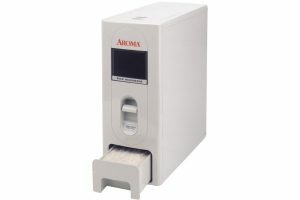 The clock and timer has a large LCD display screen for easy reading. This will be a lot more useful for people who have trouble seeing small words or numbers, usually the elderly. It has a built in retractable cord for easy storing when it is not in use, so there is no cord hanging around the kitchen for little kids to play around. 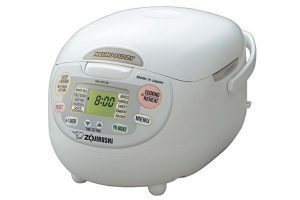 You can use it to cook porridge, mixed, sushi, white, brown, semi-brown rice, and even sweets for dessert. You can tell this cooker to cook your rice in a much faster speed with the quick cook function when you are in a hurry. I usually use the quick cook function to cook my rice since I always wait for the last minute to cook our meals in our rice maker. The result comes out the same as the regular and quick cook settings. It has a nonstick inner pan. It makes cleaning up an easy task. Are you like me and hate cleaning up cookware that has food stuck all over it? I feel like it takes forever to clean it up and it still doesn’t look clean. The inner pot also has stay cool handles for easy transport to the table or other places without getting hurt from the heat. I wish my inner pan has that. For example, sometimes I like cooking fried rice and forgot to use the mitten to hold the pot to pour the rice into the wok when it’s just done cooking and I got burned the time I forgot. Lucky I didn’t drop it though or else I would have to remake it and have a bigger mess to clean up. The rice maker also has a handle for easy carrying to a different location and the handle can be folded down when it is not being used. You have the option to change the sound of the melody for starting the rice maker and on the timer when cooking is set or finished cooking or reheating the rice. You can also set it to high, low and into beeping sound. The name of the melody is Twinkle Twinkle, Little Star, when it starts cooking or the timer cooking is set, and the melody name for the other one is Amaryllis. Isn’t it cute? This is a pretty cool idea to alert you when the rice is done. Not to mention it is nice to your ears. It is sort of music to your ears when it is time to eat. 😛 Definitely not like a basic cooker that just pops up the button when it is done. You can’t really even hear it when it is done. The convenient inner lid is detachable to take it to the sink for fast easy clean up. That is definitely encouraging more cleaning if you ask me. Some of them are not detachable and telling you to use a damp cloth to wipe it off for cleaning the lid. How inconvenient is that, and I don’t think that is good enough. This model has a keep warm, extended keep warm, and reheating cycle function. Jump ahead to read more about it. It has a timer function for you to cook your rice at a certain time to be ready to eat. This feature is great for people who have a very busy schedule or not having enough time to cook their rice in the time they need. For example, if I want to eat porridge or rice in the early morning around 7:00 am, all I have to do is put the rice in the rice maker at night time and set the timer to 7:00 am. Then I will have ready made porridge or rice to be eaten without having to wait extra time for it to cook. Just be sure the current time is correct when you are doing the setting. This one is my number one choice in a nonstick rice cooker. It has a very high average rating and it is still maintaining its high score since it’s been out in the market for quite some time now. It looks really nice with white color. It is very lightweight for me to move to a different location. It has all the features I want. The best part is this model for the non stick inner pot is replaceable if it starts having scratches and peeling off. That way I don’t have to spend money on a brand new rice maker just for that reason while it is still working just perfectly fine. Click here to buy or read more of the Zojirushi NS-ZCC10 review. Pros: It is easy to use and clean up. Cooks perfect rice every time without burning, sticking and drying out the rice too much like the stainless steel cooker. Made in Japan. Cons: Several users are saying this cooker is taking too long to cook their rice. Please refer to the below chart for the cooking time it needs to cook for each different kind of rice. The price is a little expensive when comparing with other ones but it is worth the money. Some of you might be curious how long it takes to cook rice with this cooker. Well, it has various times for each kind of rice, like white, brown, sushi, mixed rice and others. It also depends on the amount of water, voltage being used and other factors. Here is a chart that tells you the approximate time it takes to cook each kind of rice. Hopefully, it will be of help to you. A lot of families like to cook their rice and steam vegetable and fish at the same time to save time. I like doing that myself sometimes. The answer to the above question is most likely no since this model doesn’t have the steam function and no included steam tray, but it is not impossible. You can still do it if you are able to find the proper steam tray. If you really need this cooking function you might want to check out the Zojirushi NS-TSC10. Some of the very basic cookers don’t have a keep warm function and especially those smaller ones that cook about 1.5 to 4 cups of uncooked rice. I am guessing that they think you don’t need that feature since it doesn’t cook a lot and you will be able to finish eating all the cooked rice. You also have to unplug the cord when you are not using it each time. The NS ZCC10 does have the keep warm function. Not just only one, it also has an extended keep warm function and a reheating cycle option for you to select from. When the rice is done cooking it will automatically switch to the keep warm function and wait for you to be ready to eat it. You can leave the rice in the keep warm function up to 12 hours. That is a lot of hours. How Does The Keep Warm, Extended Keep Warm and Reheating Cycle Work? Keep Warm Function – Like I said before when the rice is done cooking, it will automatically go to the keep warm function. You don’t have to do anything unless you want it to go to the extended keep warm mode. Then you would have to press the extended keep warm button. If you don’t have that much cooked rice in the cooker then you should put all the rice in the center to prevent it from drying. When this mode is being used, it will display the hours on the LCD screen to show you the hours that have elapsed. Extended Keep Warm Function – The extended keep warm mode works almost the same way as the regular keep warm function, but with a slightly lower temperature to reduce dryness, odors and discoloration. The extended keep warm mode can’t be used for the following rice – mixed rice, sweet rice, porridge, brown rice and semibrown rice. The cooker will reject and alert you with 4 beeping sounds if you are trying to use this mode for the listed above rice. Reheating Function – If you still have cooked rice in the regular or extended keep warm function then you can use the reheating function to make the rice hotter for eating. Rice tastes much better when it is hot. This function works both on regular and extended keep warm modes. It does require you to add a little water into the cooked rice. To determine the amount of water to be added, it depends on the amount of rice you have left. One tablespoon of water for 1 bowl of rice. It is about 5.5 ounce of rice. It takes about 5 to 8 minutes for the reheating function to be finished. 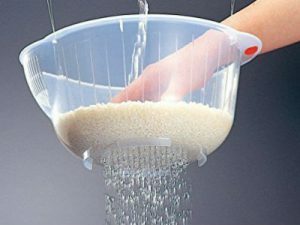 These functions are great for people who can’t eat their freshly cooked rice when it is done. As you know sometimes unexpected things happen preventing you from eating your meals on time, so these modes are made especially for those occasions. According to the manual it is fine to wash the rice in the inner pot. I would suggest to use a rice washing bowl or container to wash it instead of the included pan. That way your pan will decrease the chances of having scratches and last longer with the nonstick coating. To protect the nonstick coating on the inner pan, please don’t put it in the dishwasher. You should hand wash it for each use and don’t use vinegar for washing. I know some do use vinegar for their cleaning properties. Don’t use brushes and any abrasive cleaners to clean. A sponge is okay without the abrasive side. You should wash the pot as soon as possible if you use any seasoning to cook your rice. If you already own this rice maker and are thinking of buying a replacement for your current inner pot for this model then you may click here to buy it or to read more about it. This inner pot is designed to work with the following models: the NS-ZCC10 and the NS-ZAC10, and both of them have the 5 and 1/2 rice capacities. If you need to replace the 1.8 liters or NS-ZCC18 then you need to buy it from the official site Zojirushi. You can also replace other items such as the inner lid, measuring cups, spatula, and spatula hold for both 1.0 and 1.8 Liter from that site. It is strongly recommended to replace the inner pot if it has scratches and the non stick is peeling off. Lucky this model pot can be replaced. My current rice cooker pan can’t be replaced. I have to buy a brand new one. Yes, you would have to do it when it goes out. The battery is to power up the timer and clock memory when it is not plugged into the outlet. The battery usually lasts about four to five years when it is not plugged in. Users who bought this model recommend to plug it to the outlet all the time even when the rice cooker is not being used. It is to preserve the lithium battery life. That’s what I am doing with my Panasonic rice cooker. I have been using it for over 8 years and the battery is still working. Zojirushi tells you not to attempt changing the battery by yourself and is asking you to contact their customer service or authorized customer service.. That is to avoid any damage or harm. Actually, the cooker still functions if you plug it in. But the timer and clock have to be reset every time you unplug it. Some of you might like to know the amount of power it uses before buying it. I kind of understand if you are planning to use it with a power generator because of a road trip. It uses about 680 watts and 120 volts. I hope it meets your needs. That is very simple to do. To extend the power cord all you have to do is pull the cord outward by holding the power plug. Please do not pull the cord past the red mark on the cord. If you need to retract the power cord, then just pull the cord about 2 to 3 cm and then release it. The cord should automatically retract. Pretty simple and handy right? I am happy to tell you this rice cooker is not made in China, hooray. So where is it made then? This is actually made in Japan where its name brand is from. Users believe this one has a higher quality since it is made in Japan. It is just your point of view. I really don’t look at the product where it made, but I know a lot of people like to know that so I thought I would add this information here. You will find the following items in the box. 2 measuring cups, one for white rice and another one for pre-washed rice. Please only use those two provided measuring cups. If you are using other measuring cups the outcome might not be accurate. If you don’t know which measuring cup to use then ask yourself if the rice you bought has been washed by the manufacturer? The label on the bag should tell you that answer. If it is washed then use the green measuring cup and the other one is for the rice that hasn’t been washed. It has a 1 year limited warranty. The warranty is covered for the product against defects in materials and workmanship. It counts from the date you made the purchase from the retailer. You should save a copy of the receipt in case it is needed. The user manual is pretty important for this cooker. It does have a lot of functions and settings that you might not be able to remember at first. So you should save a copy for future reference. If you lost the included NS ZCC10 manual, then you can find an English copy by clicking here. This manual is about 26 pages long and it is in pdf format. You might need Adobe Acrobat Reader to be able to open it. The size for this manual is about 10MB and it does contain several recipes. Are you trying to find out the difference between these two models? In terms of features it has no difference, but it does in cups of rice capacity, rice cooking time, power watts, power consuming in keep warm mode, weight, and external dimensions. The price costs more since it is bigger in rice capacity. Please see the following comparing chart to find out. Power Cord LengthWhat is the length for the power cord? WeightHow much does it weigh? Power Cord Length 3.6 FeetWhat is the length for the power cord? Weight About 6.2 PoundsHow much does it weigh? Weight About 8.4 PoundsHow much does it weigh? **Credits for the comparison charts are from the manual. If you find this article useful please give it a share or comment below. Thanks!